Along with the condiment caddy Denzel sent me, he also included a bottle of his latest BBQ sauce. Although I don’t have a BBQ (condo living) I have the next best thing, my Calphalon One grill pan. Now that the balcony has been redone and is nice and comfortable this sucker is getting a lot of action. There are a lot of great BBQ sauces out there no doubt. Many we hold true and dear to our hearts and have become our “secret recipe”. If there is one BBQ sauce I can encourage you to try this summer it would be this one. The only downfall is that it doesn’t come in a bigger bottle as this will last you one good application for a family meal. Denzel has always had attractive looking bottles so we won’t get into details about that. Let’s focus on the sauce. I hope you took a look at the ingredients list. There is one component that is thankfully missing that you unfortunately find in most BBQ sauces. High fructose corn syrup. Instead what you see here is what you get. And each flavour stands on its own. The other notable is that the molasses is very subdued in sweetness but gives the sauce a very decent stick quotient and makes this BBQ sauce have perfect viscosity. Most notable are how the Crannog Stout beer and chipotle peppers play together. The add a lot of heft to this sauce and make the taste heavy and smoky but without the smoke being overbearing. The aftertaste is extremely satisfying and rich. I found myself sampling this with my finger straight from the bottle as I was preparing the chicken. As for heat. Well there isn’t any. Nor is there supposed to be. This is BBQ sauce at its best (sans heat). Do yourself a favor and give this one a try. Thankfully the other common thing missing is liquid smoke. Shouldn’t the smoke flavor come from the actual BBQ or grilling process? 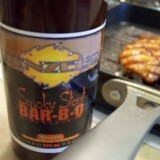 Do some research on liquid smoke!!!! It is made directly from Natural Smoke, an easy way to explain it, smoke extract. If that makes sense. Natural smoke helps cure meats and other products from its chemical break down of the wood that is used. If you would capture the thick condensation on the top of the smoker it is a mild example of liquid smoke. When i use sauce or marinade (even in the last 2 minutes) it all gets burnt on my skillet. how do u do that so it looks so nice ? ?